There’s a certain sense of satisfaction that comes with leaving the beaten path far behind. A longer line of sight, fantastic new scenes, and the knowledge that you’re seeing something few others ever will — these are things that Range Rover drivers know well. If you’re looking to elevate your everyday exploration, take your adventures to stunning new heights, and do it all with style, visit Land Rover of Richmond today, and check out our lineup of Range Rover models. There’s no better place to find a Range Rover for Surrey drivers! At Land Rover of Richmond, we’re committed to matching you with a Range Rover that’s equipped for any adventure, big or small. Our incredible lineup is available to you 24 hours a day and includes the classic Range Rover, Sport, Evoque, and Velar options. Once you’ve selected the perfect SUV with the help of our expert sales team, our finance specialists will help tailor a solution that suits your lifestyle perfectly. Your fantastic dealership experience doesn’t end once you’ve parked your Range Rover at home. The trained technicians in our service department will help keep your vehicle performing the way a Land Rover should. Visit us today, and discover all the ways we go above and beyond for you. You can find us at 5680 Parkwood Crescent in Richmond, BC, or call us at 604-273-6068. Nobody knows your Range Rover better than our expert technicians at our dealership near Surrey. Land Rover of Richmond is proud to offer service for your Range Rover in many different languages. From bumper to sumptuously-appointed bumper, the Range Rover was designed with the driver in mind. Watch the kilometres roll effortlessly by from the optional 24-way climate “hot stone” massage seats. Passengers will enjoy the choice of heated rear bench seating, or the exquisite Rear Executive Class Seat option. Set the right mood with Configurable Ambient Lighting which offers 10 different shades. The weather is always perfect in the Range Rover, thanks to four-zone climate control which lets everyone maintain their optimal temperature. Whether you’re driving home to Surrey or heading elsewhere, the interior of the Range Rover is a nice place to be. Visit us today to find your next Range Rover! Whether you’re navigating the concrete tangle of city streets, or getting out there and exploring the roads less travelled, every trip will feel fantastic, thanks to Adaptive Dynamics. This remarkable system monitors vehicle movements up to 500 times a second, and reacts almost instantaneously to changing road conditions or driver inputs. This results in superior control, and a composed, refined ride quality. Similarly, Dynamic Response minimizes the amount of body lean through corners, which gives the Range Rover greater agility and stability, no matter where you roam. You might not think that a luxury SUV could be environmentally responsible, however, Land Rover has demonstrated a marked commitment to sustainability. 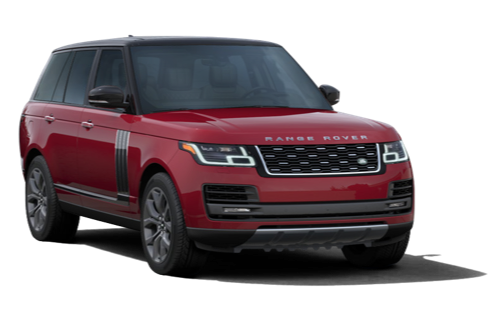 Accordingly, the Range Rover is 85% recyclable and 95% recoverable, which helps conserve resources and reduces waste. Recycled material is incorporated into the body sheet during the manufacturing process, which provides performance benefits as well as a reduced footprint. The intelligent Stop/Start system, in conjunction with ECO mode, ensures that your Range Rover runs as efficiently as possible. In a Range Rover, safety is more than simply a comprehensive array of airbags and seat belts. It’s a suite of intelligent systems that work together to prevent injuries and accidents before they occur. Advanced electronic traction control lets you drive with precision on any terrain by redistributing torque and applying braking force as needed to control wheel spin. Stop a collision in its tracks with Autonomous Braking and Emergency Brake Assist. When you choose a Range Rover, you can explore with confidence, knowing you and your passengers are surrounded by smart safety.